On arrival at the Cochin airport the Morningkerala Holidays Tour representative will meet you and assist you to check in at a hotel. 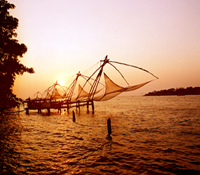 Stay overnight at Cochin, Kerala, South India. Drive to Kumarakom . On arrival check in at a backwater resort. 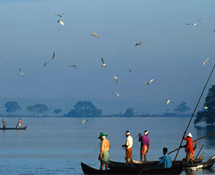 Enjoy evening tours to the Bird sanctuary located close by. Stay overnight at the Kumarakom, Kerala, South India. Enjoy a refreshing herbal oil massage at the ayurvedic resort and feel differently about yourself as you enjoy natural Kumarakom. After breakfast you check in on a houseboat and begin a luxury cruise on the peaceful Kerala backwaters sparkling with dancing sunrays. Course through the twists and turns on the Kerala backwaters and see a water world that is so different and so beautiful. Overnight on the houseboat. On arrival at Alleppey drive to Kovalam and check in at a beach resort. Spend the day at leisure. Stay overnight at Kovalam, Kerala, South India. 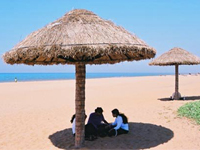 On the final day of the Beach and Kerala Backwater Tour the tour representative drives you to the Trivandrum airport so that you may board a flight to your onward destination. -Kathakali dance performance in Cochin. 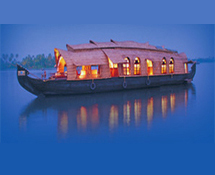 - Overnight stay in a houseboat in Kumarakom including lunch, dinner & breakfast. 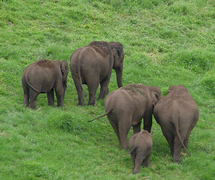 After breakfast, drive from Cochin to Thekkady. Thekkady is tucked amidst lush green tea gardens, it is one of the best places to visit tea, coffee and spice plantations. After breakfast, this day is free at leisure to explore the surroundings. After breakfast, drive from Thekkady to Kumarakom. Overnight stay at the houseboat sailing through the backwaters of Kumarakom. After breakfast on board the houseboat, disembark from the houseboat in Allepey and drive from Allepey to Kovalam. Remainder of the day is at Leisure to enjoy the area and the beautiful beach. After breakfast, you can spend a leisurely day on the golden beaches of this splendid coast. - Overnight stay in a houseboat including lunch, dinner & breakfast.